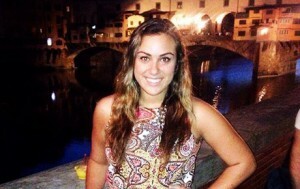 “I spent my fall 2014 semester studying in beautiful Florence, Italy. Since I finished my major requirements at Ramapo, I was able to take art electives there. What better place to study art than Italy? While in Florence, I caught the travel bug and found myself in a different country of Europe each weekend, including France, Spain and England. Being of Italian background, I ventured to Sicily to meet and stay with my relatives. That proved to be one of the most amazing experiences. Although reluctant at first to travel, I took a step out of my comfort zone and made the decision to study abroad. Looking back, it was the most eye-opening, enriching and rewarding experience of my life thus far.”- Francesca Lio ’15 graduated in three years with Latin Honors with a degree in Psychology. While at Ramapo, Francesca was a member of the Sigma Delta Tau National Society of Collegiate Scholars (NCSC). Francesca is currently a Spa Coordinator for Hackensack University Medical Center.